Use this forum to post information specific to your 16' 0" Prospector project. Use POST REPLY when posting information. Please stay on topic. For general boatbuilding discussions, please use the Builders Forum instead. With a friend of mine, we are on our way to build a 16' Prospector. Right now, we did the strongback and molds, and are about to finish the strips. I'm living in Switzerland and I know it isn't very easy to find suppliers and products for wood canoe. My father has a sawmill and wood business and he helped us a lot to find good Western Red Cedar. If you are on the way to start a project, or whether you already strarted your project and need help, don't be afraid to contact me. Hi. I recently started my first canoe project. I have thought about building a boat for years but never got around to it. I got the bug again a few months back and have been eating, drinking, and sleeping with canoe books and reading every thing I can on-line. I recently purchased plans for a Bear Mt Prospector and have been slowly making progress. I built the strongback, and cut out the station molds. I have steamed my stems and have been working at ripping my planks. I was lucky to meet a guy near my home who had a supply of 20' redwood planks that I got at a fair price. I am getting some excellent full length strips from these that I will rout a bead and cove on when I am done ripping. I have limited space so I have to get my table saw out of the way to make room for the routing procedure. I am very enthused by all on this forum and am enjoying this project much more than I expected. The only problem is my wife says I am not doing enough of my other projects right now. "I don't fully understand everything I know!" I have recently completed my first Prospector and already sold it. It was made from western red cedar and ash. My second one needs just fine detailing. I have found blending the inter and outer stems into the canoe to be a little tricky. Has been a lot of fun building the canoes. I'm going to post a picture of the completed canoe once I figure it out. My second canoe is made from Sitka Spruce and Dark southern red cherry. I really like the way the Prospector paddles. Well I just finished clothing the outside of hull. My wife agreed to help but no yelling.Went great. My wife mixed resin and I put it on. When ready to squeegie. My wife applied resin and I squeegied. Went well. Kinda tricky getting the loose material used up but turned out good. Good luck to all and keep in touch. Last night I finished my canoe by installing the seats. I had been waiting for the varnish to cure before handling it too much. I am quite pleased at how the canoe turned out, with just a few wavy areas on the inside. I will post some recent photos soon. I wish to thank all the members of this forum for the help and guidance throughout this building experience. Being a member of this forum has been, and is a privilege. Thank you. Congratulations David, you must feel great about your accomplishment. Post some pics when you get a chance and let us know how the maiden voyage goes when the weather is better. Thanks for the kind words. 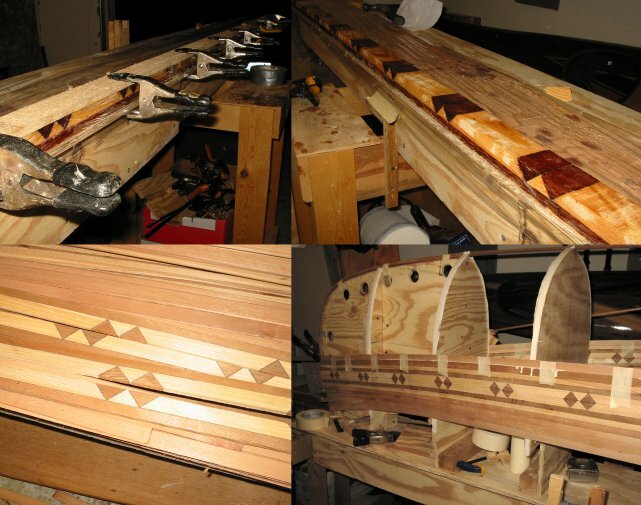 I have posted some new pics of the finished canoe. It is still in my cellar at the moment. When it stops raining I will take it outside. Love your accent strips!!!! Was that all constructed in place on the molds???? Really great looking canoe. The features stripe was layed up in halves before putting it on the forms. It was made a s single board that was then sliced into 1/4" thick strips. See my Prospector web page (link above). What type of woods are the accent strip made up of ? The colors seem to go well with the WRC. I am looking for color combinations for my up and coming project. The dark wood on the feature stripe in my Prospector is western red cedar. The light color is basswood. 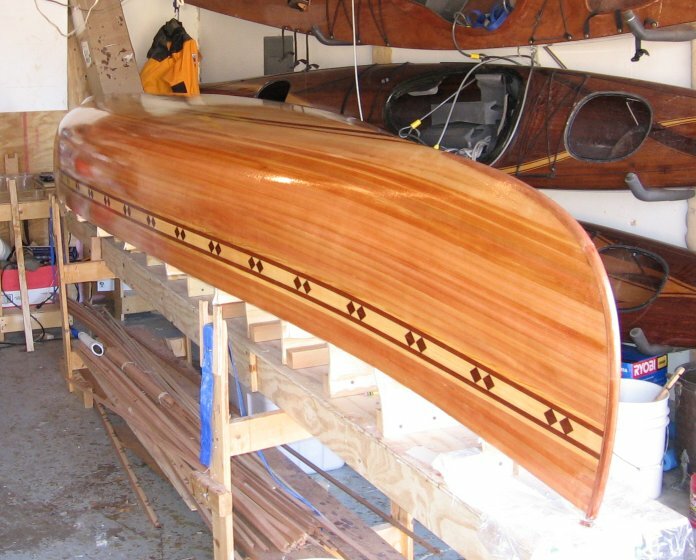 John, the accent stripe looks so good I might copy it on my next canoe project, if you don't mind.